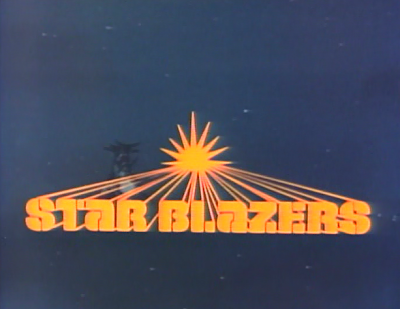 In this episode of animated series, Star Blazers (1979), The Argo’s energy transmission unit fails upon the vessel’s departure from Jupiter. To become functional again, the battleship now requires special “titanium” crystals only found on Saturn’s moon, Titan, an inhospitable, frozen world. The Argo deploys small mining crafts to the icy surface, with Wildstar, Nova and IQ9 all participating in the recovery mission. 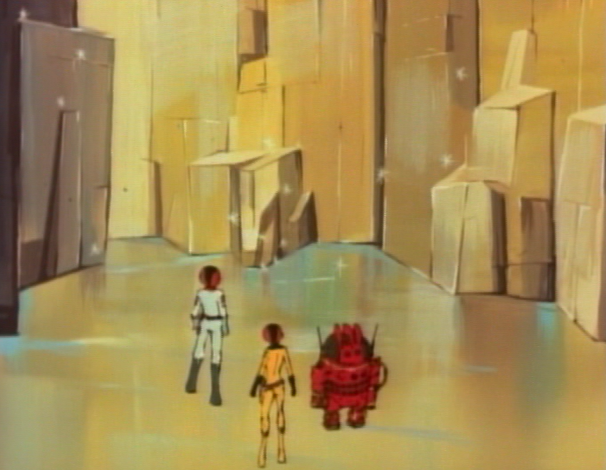 Unfortunately, the Gamilons learn of the expedition, and deploy space tanks to run off the Star Force. IQ9 lifts and destroys one such tank, and Wildstar escapes from captivity after finding an operating hand-gun in the ice. Incredibly, the gun belongs to Wildstar’s dead brother, Alex. Derek, Nova and IQ9 soon also locate Alex’s crashed ship -- now a derelict -- the Paladin. The heroes manage a return to the Argo before being captured again, and Wildstar wonders if his brother, even in death, is still looking after him. “I see it would be hard to be human,” IQ9 notes in this episode, and that’s very much the point of the story. Here, Derek unexpectedly finds evidence of his brother’s death, and must come to terms with it. He is told by Avatar that Alex “survives” in him, and in “the Star Force” but the episode nonetheless carries a heavy emotional wallop. One of the final scene finds Wildstar and Captain Avatar talking about what Wildstar found on the planet, and a single tear drop falls from Avatar’s face. I wondered if he was crying for Alex Wildstar, who gave his life to save the Earth flagship, or for his only son, who also died in the Battle of Pluto. Captain Avatar has been my favorite character on the series thus far, but Wildstar grew on me a bit in this episode, in part because his discovery of Alex’s hand-gun and the Paladin is so damned unexpected. A viewer definitely shares his sense of surprise at the discovery. So far, Wildstar has seemed -- at least to me – hard-headed, impulsive and temperamental. This episode shows a bit more shading than that, and I appreciate it. I know that Star Blazers is actually his “hero’s journey,” so I’m watching his maturation closely. 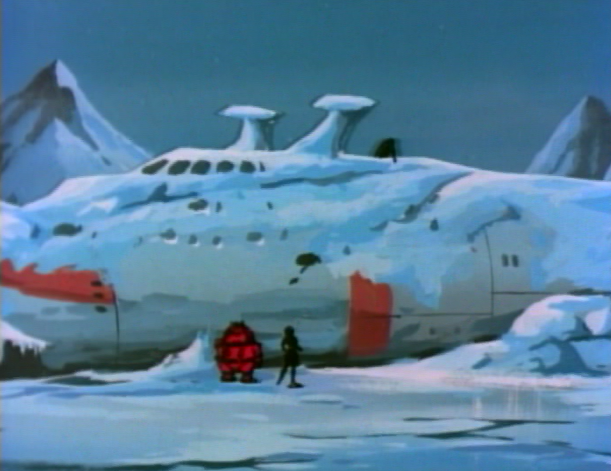 Once again, the visuals in Star Blazers are quite dynamic, and even beautiful. There’s a shot I absolutely love here of the icy planet surface as the Argo suddenly becomes visible, moving into the frame, overhead, above mountains. It’s as though the great ship has been obscured in thick mist or fog, only to break through that barrier and emerge clearly. This composition while being quite beautiful, also “sells” Argo’s size. She’s a huge ship. The most emotional visual section of the episode, however, involves a montage of the derelict Paladin on the ice cliff. A variety of shots show reveal the destroyed ship alone in the ice, an image of isolation and loneliness. On the last final withdraw from the ship, we see the ship from Wildstar's perspective as the Paladin seems to blend into the ice itself, a lost memory. It's haunting. 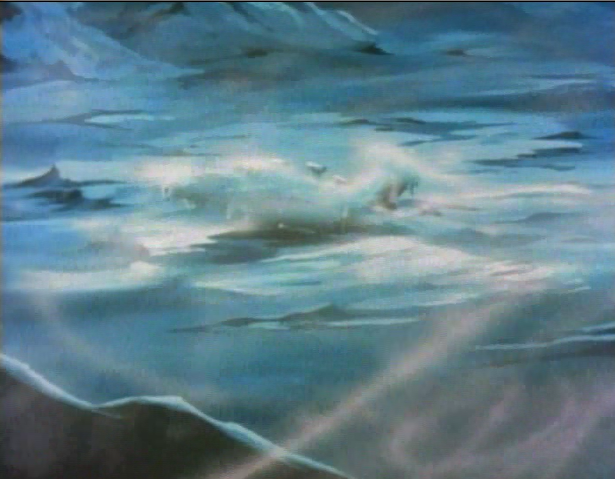 I also really admired the final flyby of Argo in this episode. 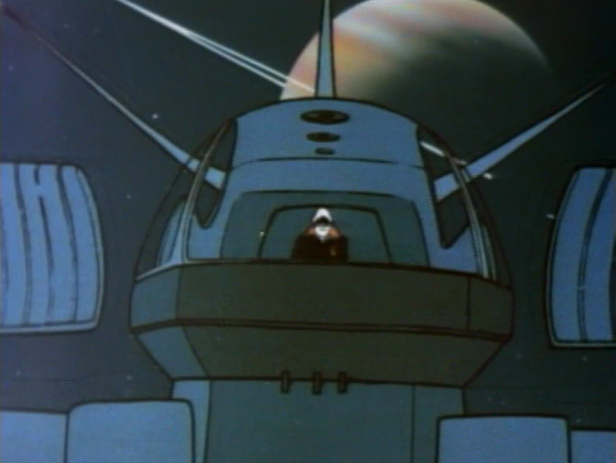 As the ship goes by, Captain Avatar is visible standing alone in the top tier of the conning tower, presumably in an observation deck. He cuts a solitary, sad figure, but I loved the point of detail. Well, cold is putting it mildly, isn’t it? And it Titan doesn’t possess an oxygen-nitrogen atmosphere like Earth? The expedition should thus all be wearing space suits throughout the journey. Again, my barometer is this on “distraction.” If I’m pulled out of the story by a technical point that seems wrong, it bears mentioning. This is another one of those details. 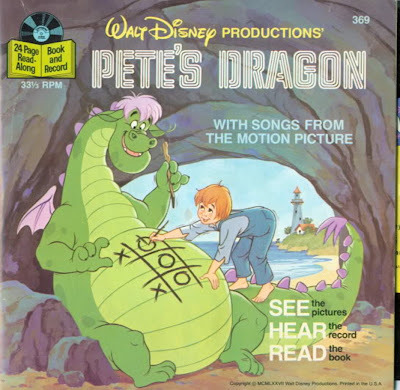 All these problems could have been removed from the series if only the writers specified that Argo had journeyed outside our solar system already, and was visiting new, unexplored worlds. Then, they would have no responsibility to conform to our understanding of our neighboring worlds. 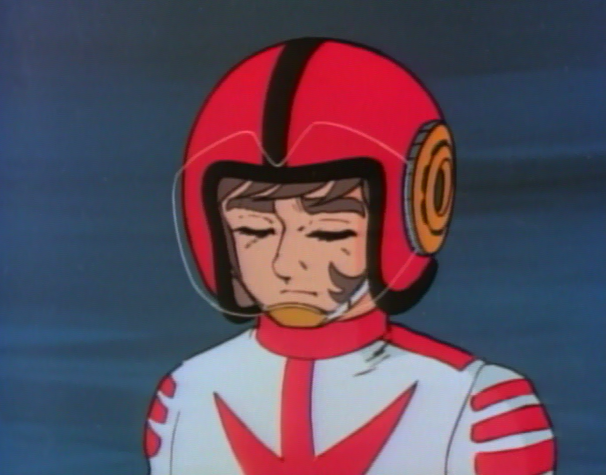 John, nice review of yet another emotional episode of Star Blazers.